This vintage Simplicity sewing pattern is cut, but all pieces are there. It is sized Misses size 8. ​ the design has optional yoke and lace insertions, so you can make this retro blouse as romantic as you dare. This October 1994 back issue of Crochet World is in good condition. It's full of patterns and projects for fall. You will find instructions to crochet a pumpkin patch place mat, a witch's hat party favor, fall leaf pot holders, aschool lunch bag and pencil case, twin bed country coverlet, a cow kitchen set, a stained glass pillow, and a Miss Australia international doll costume (from their international doll series). My favorite design is the thread crochet gingham place mat pictured on the cover. Please note the color key is missing, so you will have to work out your own colors. The stitch count is 128W by 90H. The "recipe" part of the picture is worked in back stitches. This 2 page loose pattern ships in a 3-hole vinyl sheet protector, so you can store it in a 3-ring binder, which is how I organize my loose pattern collection. ​This loose pattern by designer Briggite Kozma features a cross stitch design based on her Eagle Bluff Lighthouse painting. This heirloom project uses 30 different colors to capture the beauty of the original art. The stitch count is 127 x 112 and is worked on 14-count Aida. This is an uncut and factory-folded McCall's pattern, with unisex sizing for Small, Medium, and Large. The chest measurement run from 34-36 for small to 42-44 for large. As pictured, the envelope shows some shelf wear. The pullover caftan or tunic is very loose fitting with dropped shoulders and button-loop closure at the front neck slit opening. The pull-on pants have side pockets and an elasticized waist. This pattern will also make a lined hat and head-wrap. This vintage crewel embroidery kit is dated 1981 and has been opened. The stamped fabric was taped around the edges, but that was as far as the former owner got. The kit is complete with stamped fabric, thread, instructions and a crewel needle threaded in a corner of the fabric. Please note the tape has discolored the instructions, but they are very readable. The stamped fabric features the saying "Remember yesterday, ponder tomorrow...but Live for Today." The floral garland is light and delicate and features lots of satin stitch. The thread that comes with the kit has a lovely matte look and feels like a DMC flower thread. The finished picture will fit in a 11 by 14 inch frame. This uncut and factory folded Butterick pattern makes matching pullover sleeveless dresses for mom & daughter. Mom's dress is ankle length and daughter's dress is lower calf length. The contrast collar is a very nice touch, as well as girl's headband. This multi-size pattern makes Misses 6, 8, 10, 12, 14, 16, 18 and children's sizes 2, 3, 4, 5,6 6X. This 2 page cross stitch leaflet is called Handprints. It folds out to a big cross stitch chart. The leaflet is in very good condition. This pattern is sweetly nostalgic about "how my little hand looked when I was very small". The poem is bordered by nursery and children's motifs such as blocks, balls, teddy bear, stuffed rabbit, top, and rocking horse. There is space for your infant's hand to be printed on the fabric with acrylic craft paint. The space is big enough to fit handprints up to page 2. This 25 page softcover booklet is in fine shape, except for the prior owner's name in ink on the back cover. This book is straightforward, with plenty of detailed and easy-to-follow instructions on how to cover cardboard with fabric. The projects rely on fabric glue and carpet tape, and the minimal use of a sewing machine. This 26 page softcover leaflet from Needleworks is titled "A Charted Christmas Album." It is their leaflet No 101. The designer is Vicki Neil Getchell. The leaflet is in good shape, with clean, crisp pages, and easy to read charts. Please note there is a crease to the upper corner of the back cover(as pictured) and small dog-ear folds on a few pages. Most of the Christmas projects, which features traditional motifs like elves, Santa, angels, a sweet angel scene, and reindeerof course, are worked and charted for cross stitch. However, there are seven projects that the designer calls "Colorwork" as they use blackwork stitches, but with traditional holiday colors. I also love her Christmas "ball" ornies, that feature cross stitch bands around styrofoam balls. This 8 page leaflet is called Tis the Season. The publisher is Gregg Designs. There is a sticker on the front of the leaflet. The Christmas themed designs feature children playing in the snow, and elves playing musical instruments. Leaflet includes instructions for making flat ornaments, round ball ornaments, and a tree skirt. This 49 page softcover Hook Book is Bernat book # 178. Published in 1971, it is an inspiration book with plenty of ideas for rug designs including patriotic, nature, marine, and geometrics motifs. These motifs are not charted, they are presented as ideas to be enlarged and transferred to your own rug canvas. Because the only designs that are actually charted are for a Greek Key rug, monograms, and a page of border designs, I would consider this an idea book for developing your own designs. Plenty of tips are included for making your own latch-hook rug. Please note this over-sized book ships with USPS Media Mail. This little 33 page vintage Learn to Crochet leaflet is a tiny treasure, measuring just 5.5 inches by 7.5 inches. Published by Coats & Clarks in 1971, it will teach you how to make a chain and single crochet. Using lots of fun projects with retro styling, you will learn how to increase and decrease, and make textured stitches like the cluster, popcorn and shell. There are even projects with filet crochet and hairpin lace. I especially love the granny square skirt. As pictured, the front cover has a dog ear fold, as do some of the pages. But otherwise, the pages are clean and unmarked. Virtues is a beautiful 40 page softcover book by quilting designer Jeana Kimball. It features a large applique quilt based on the Whig Rose pattern. There are 8 color pages and full-size patterns to trace or copy for personal use. Quilt blocks include five variations of the 19th century Whig Rose design. The outer border of flower pots adds a very special touch. I love the antique colors of green, rose and red. The Virtues are noted in words placed throughout the quilt. This book is in great shape, but a note to the former owner appears on the first page in ink. This is a 2 page chart for the 1992 Arcadian Angel from MarBek's Angel Collection. Rebecca Waldrop is the designer. Please note the leaflet is lightly creased from storage and has a price sticker on the front as pictured. This design is charted in varying shades of red and black. The design area is 138W by 144 H. The color palette is blue with yellow accents. Lots of blending filament gives this angel a special touch. She is a very delicate vision with streamers from her dress blowing as she steps lightly across a stream. This 29 page softcover booklet, has 12 large cross stitch projects--one for every month of the year. 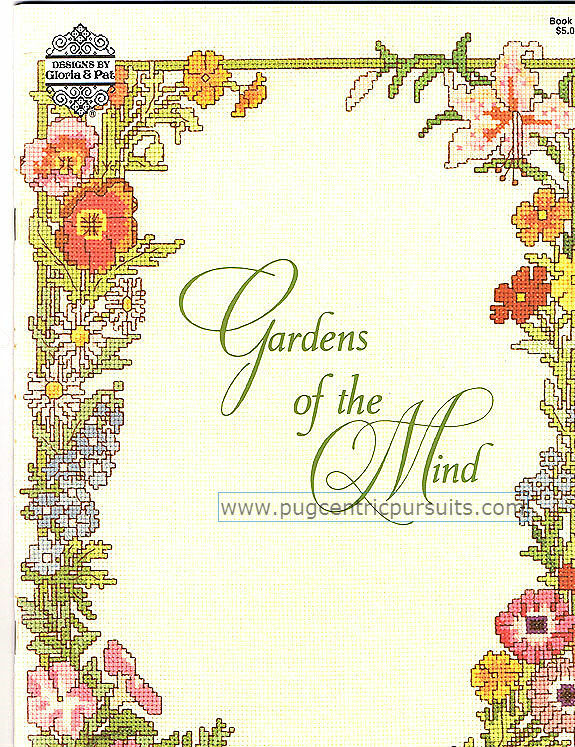 Each design features lush flower borders, and nostalgic, thoughtful quotes from writers and philosophers such as Harriet Beecher Stowe, van Loon, Addison and Emerson. Sized for Misses 12,14,16. Adjustable for petites too. Envelope shows green marker. Slim pull-on pants, a sleeveless top with a square neckline and side slits, and a matching front button shirt in two lengths. December 2005 issue of Woodworker's Journal magazine. This 102 page issue in good condition, but please note the mailing label on the front cover. The projects in this issue include "the ultimate router table" and a Roycroft-style magazine stand. This delicate miniature bedspread measures just under 6 inches wide. It is an original design and One Of A Kind. The pretty medallion in the center is bordered by rows and rows of a filet crochet lacet stitch, which is so dainty and feminine. Filet crochet was much loved by the Victorians, so this tiny afghan will work well with a traditional dollhouse decor. I displayed it on a miniature queen-size bed, but it would also look great folded as an afghan in your miniature parlour. I am offering a vintage cross stitch pattern booklet, Country Sportsman, published by Country Cross-Stitch in 1979. This pattern book is 16 pages long and in very good condition. It features birds, hunting dogs, and would have great appeal for the bird hunting sportsperson. Each project is based on original watercolors by Tallahassee artist Louise Thigpen. Projects include Labrador Retriever & Mallard, Pointer & Quail, Pointer, Setter, Golden Retriever with Redhead, Mourning Dove, Wood Duck Sitting, Bobwhite Quail in flight, Canada Geese in flight, Wood Duck in flight and Ruffed Grouse. This vintage Simplicity sewing pattern is cut, but all pieces and instructions are present. This pattern # 6033 is size 8 and dated 1983. There are two long sleeve variation. I love the very dramatic look of the long cuff and very full sleeve version...very Edwardian. Variations include stand-up collar, front tucks, jabot, and lace yoke. Blouse has back darts and buttons in the back. This vintage gypsy dirndle skirt pattern is sized for a 26.5 inch waist. Published in the 1970's, this pattern is uncut and factory-folded. Envelope shows some shelf wear. There are 4 versions of this gathered skirt, both mid-calf and full-length; you can decide how flouncy and long you want it. The skirt has back zipper and a matching scarf. This uncut pattern is from the Simplicity Crafts series. This pattern will make a darling rag dolls with plenty of nostalgic charm. Perfect for a cottage chic home decor. Projects are for a prim rag doll and old-fashioned clothing in two sizes, 10 inches and 15 inches. Envelope shows some minor shelf wear. This McCall's sewing pattern 8345 is uncut and factory folded. The sizing is XXL or Misses 24 26. With just 10 pattern pieces, the pattern is a fast sewing project for a loose fitting pull-on dress. There is a short and long sleeve version, and optional patch pockets. The long skirt gathers to an empire bodice. With a color blocking option for the skirt, this pattern has lots of creative potential. This is a 12 piece pattern in misses sizes 8, 10, 12, 14, 16, 18, 20. Published in 1991, this pattern is uncut and factory folded. This classic sundress has a fitted bodice and a gathered front yoke with a sweetheart neckline. There is a back zipper and back ties too. The gathered skirt is mid-calf length. 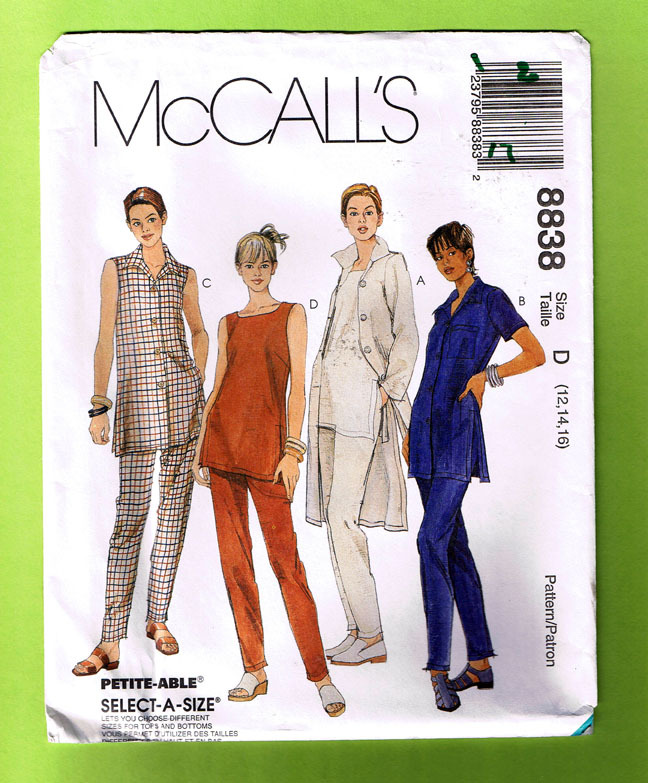 This is 1997 McCall's pattern #8837 to make an easy fitting jumper or jumpsuit. The pattern pieces are uncut and factory folded. The envelope has some minor storage wear. It is sized for Misses 14 16 18. This jumper and jumpsuit features a bib style front and back straps that criss cross and button. The jumpsuit has an elastic back; the jumper as a back zipper. Each includes optional side pockets. This summertime fun sewing pattern will make a jumpsuit and casual top. Please note, though, that the pattern for the loose-fitting top has been cut to size 12 lines. The jumpsuit though is uncut and sized for 12, 14, 16. The jumpsuit design is loose fitting with a dropped waist, back zipper, low neckline, and leg bands. Canterbury Designs Book 5 is an 8 page leaflet. The sayings include "Bless this Hard working...", "Bless this Humble...", Bless my Lovable...". The charted occupations include secretary, doctor, dentist, banker, engineer, realtor, teacher, nurse, lawyer, minister, friend, pharmacist, executive, salesman, coach, accountant, supervisor, woman, gardener, architect, neighbor, aunt, mother, grandma, grandpa, daddy, hairdresser, receptionist, principal, professor, student, administrator, clerk, boss, and of course, cross-stitcher. This unusual 4 page leaflet is called This and That...Down on the Farm. 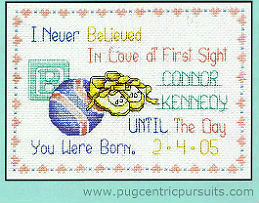 The cross stitch designs are elegant and simple, with just a few color changes. The charts are very easy to read. Patterns include farm sampler, combine, tractor, general store, hearth and stove, pig, rooster, lamb, cow, pig, and farm house. Leaflet is in mint condition. This uncut, factory folded pattern will make four pairs of hugging animal babies. The plush animal friends are 9 inches high. The patterns will make a pair of bears, kittens, bunnies or puppies. This girl's sewing pattern is sized 7, 8, 10, 12. It is uncut, but no longer factory folded. This 12 piece pattern is dated 2003. This uncut and factory folded robe pattern in two lengths was published in 1994.